Faster checkout process, free shipping on all orders over $50▵, easy access to purchase history & tracking information plus be in the know for all promotional events & flash sales. Easy access to your purchase history means easy access to reprinting your tax invoice; should you need this for supplier warranty purposes on styling tools. Looking for your Style Society Membership status? You can find all the details here. 1. The product is faulty. 2. The product is significantly different to what was shown or described to you. 3. The product is not fit for the purpose you made known to us before we supplied it to you. Subject to the above circumstances, wigs, jewellery, make-up, nail polish, brushes, hair accessories, colours, bleaches and peroxides are non-refundable due to hygiene reasons. For all enquiries relating to returns, please email enquiries@hairhousewarehouse.com.au with your order number and reason for returning your item. Goods will be sent via registered post with Australia Post wherever possible. All orders are shipped from Melbourne, Australia. We endeavour to dispatch orders which are in stock within 2 business days of receiving confirmation of payment. HHWH Online Pty Ltd has no control over, and makes no warranty in relation, to the performance of Australia Post or any other company which we may use to deliver our goods. ^ Hairhouse Warehouse Online Pty Ltd offers Style Society members FREE standard postage and handling (within Australia) on all orders $50 and over. For all orders under $50 a shipping charge of $9.95 per consignment applies. Receive FREE standard postage and handling (within Australia) on all orders $80 and over. Shipping charge is a flat rate of $9.95 per consignment for all orders under $80. Please allow between 3-5 business days for delivery from date of dispatch to Victoria, South Australia, Tasmania, New South Wales and Southern Queensland, and between 4-6 business days for delivery to Northern Queensland, Western Australia and Northern Territory. Express shipping is available for a flat rate charge of $19.95. Please allow 2 to 3 business days for delivery from date of dispatch. Dangerous goods (e.g. Nail Polish, Hair Colour and Aerosols) cannot be sent via Express Post. Due to the nature of dangerous goods (e.g. Nail Polish and Aerosol Hair Spray) HHWH Online Pty Ltd cannot deliver to certain destinations. We are currently unable to fulfill international orders. I need another copy of my receipt for warranty reasons. Can you help? I haven't received my order yet. What's the status? You will receive an email upon dispatch of your order. You can use this link to track the status of the order at any time. If you did not receive a tracking email or need further assistance, please contact us HERE. I'm trying to track my order but this says delivered? Our orders are delivered using Australia Post e-Parcel service. If you did not receive a delivery notification from Australia Post, please contact us HERE and we can support you in locating your order. I put the wrong delivery address on my order and need to change it. How do I fix this? We cannot guarantee an order can be edited once it has been submitted. If you need to make a change to your order, please contact us immediately at HERE. We cannot guarantee an order can be cancelled once it has been submitted. If you place an order you would like to cancel, please contact us immediately at HERE. Where possible we will work to assist you. I had problems placing my online order and I'm scared that my order went through multiple times. Please contact us HERE for any assistance related to your online order. Style Society is Hairhouse Warehouse’s new loyalty program. As a Style Society member, you earn 1 point for every $1 spent on products in-store and online, and 2 points for every $1 spent on selected brands and all services. When you earn 500 points, you will be rewarded with a $15 voucher. Plus, you get money-can’t-buy benefits such as first access to sales, invitations to VIP events, competitions and lots more. Click here to learn more about Style Society. How are loyalty points calculated? Services = salon, piercing and beauty. Selected brands (but not limited to) = m a k e, Dare, halo, Curious Grace and Colour Royale. How do I join STYLE SOCIETY? Joining Style Society member is easy - and free! You can sign up online, or our staff in-store will be happy to sign you up while you're there. If you join online, you'll be emailed a loyalty membership number which allows you to start earning points immediately. If you join in-store, you can choose if you would like a loyalty card, however you don’t require a physical card to access all of the member benefits; our staff can easily look you up in-store by your email address. What is the difference between the previous loyalty program (TLC or STYLE CLUB) and STYLE SOCIETY? There are many differences between the previous loyalty program and Style Society. TLC (Style Club in WA) allocated points for every dollar spent, which set a member’s status level. Each quarter, members were sent out vouchers to redeem in-store. However, our new program, Style Society, offers many more tangible rewards. For example, every dollar spent earns points that then turn into rewards vouchers. Are my points from the previous loyalty program transferred to the new program? Your points from our previous loyalty program (TLC or Style Club) are not transferred across to the new loyalty program, Style Society. The reason for this is that in our previous loyalty program, the points only set your status level - they did not earn you actual rewards. With our new loyalty program, Style Society, you receive points for every dollar spent, earning you credit to spend. What if I have two loyalty ACCOUNTS? It’s important that you have only one loyalty account, to ensure that your loyalty points are being allocated to the correct account. If you believe you may have two loyalty accounts, simply call the customer care team on email enquiries@hairhousewarehouse.com.au with your account details, email and card numbers and we’ll help sort it out. Is it mandatory to provide an email address to participate in the program? Yes, it is mandatory to provide an email address to participate in Style Society. We need a valid and unique email address because all the program benefits, including rewards vouchers, are communicated electronically. How can I look up my loyalty points and status? You can look up your points, loyalty status and voucher availability at any time, by signing into your Style Society account here. Where can I use my loyalty account? You can use your loyalty account in any Hairhouse Warehouse store, or online at the Hairhouse Warehouse website. You can get a Style Society card at any Hairhouse Warehouse store. If you are an existing (TLC or Style Club) loyalty member or have already registered on-line prior to receiving a card, simply provide your registered email address details to any staff member in-store and they will provide you with a card linked to your account. Simply present your Style Society card in-store so that your purchases are allocated to your member account. Online transactions are automatically allocated when you log-in and complete a purchase. Do I need a loyalty card to participate in the program? No problem! If you lose your card, you can be looked up in-store with your email address and still maintain all the program benefits. Hairhouse Warehouse is not responsible for stolen or lost cards, or cards that are used fraudulently. How do I receive my rewards vouchers? Once you have earnt 500 points, you will automatically be emailed a $15 reward voucher. Rewards vouchers can be used on any product or service, at any Hairhouse Warehouse store or online. You will need to ensure your Style Society contact details are up to date here. Please also review the Hairhouse Warehouse terms and conditions here. Yes, rewards vouchers expire one year from date of issue. The date of issue is included in the rewards voucher email. No, your points do not expire. They continue to accumulate until you have reached 500 points, at which point you will be emailed a $15 rewards voucher. How long does it take for my points to be added to my account? What is my loyalty status? How do I become a level 2 HIGH STYLE SOCIETY member? Upon joining Style Society, you will start out as a level 1 Style Society member. If you earn 1,500 or more points within 12 months of joining the program, you will be eligible for level 2 High Style Society status. What is the benefit of being a level 2 HIGH STYLE SOCIETY member? The benefit of being a High Style Society member is that you earn 1.5 points on product purchases and 3 points on selected brand purchases and all services. How do I maintain my HIGH STYLE SOCIETY status? To maintain High Style Society status, you need to earn at least 1,500 points every 12 months (calculated from your joining date). 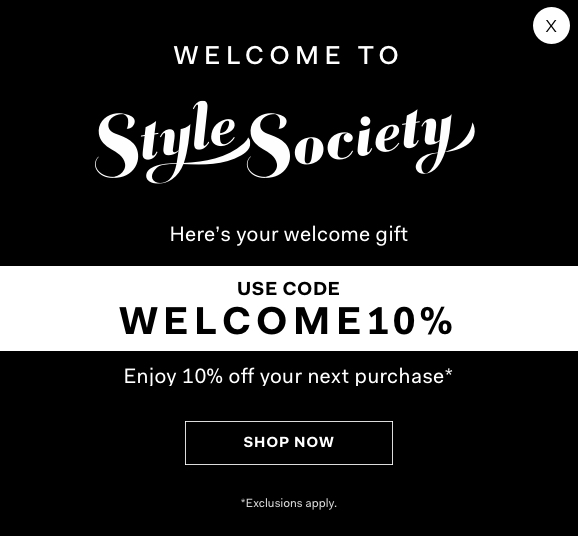 How do I sign in to my STYLE SOCIETY account? You can sign in to your Style Society account by clicking the Style Society log-in button, located on the top left-hand side of the Hairhouse Warehouse home page www.hairhousewarehouse.com.au, and then follow the instructions. Change your password by signing into your Style Society account here, enter your email address and click on ‘Forgot password’. An email will be sent to you, to allow you to update your password. How do I update my STYLE SOCIETY account information? Sign into your Style Society account here. Click on the ‘My Profile' tab, then update your information (name, address, phone, email, etc) before clicking ‘Update’. Why am I not receiving any emails from HAIRHOUSE WAREHOUSE? If you are not receiving any emails from Hairhouse Warehouse, your address may not have been recorded properly in our system. Please check your details are correct under the 'My Profile' section here of the website. If you are unable to update your details in your loyalty account, simply call our customer care team on or email enquiries@hairhousewarehouse.com.au with your account details, email and card numbers, and we’ll help sort it out. To unsubscribe from Hairhouse Warehouse communications, click on the ‘unsubscribe’ link at the bottom of an email you have received from us, and follow the prompts. How can I change my preferred store? You can change your preferred store by signing into your Style Society account here. At the bottom of your Style Status page, there is a ‘Preferred Store’ drop down menu – simply make the required change and click update. We’re sorry to hear that you’re considering cancelling your membership! Remember that by relinquishing Style Society, you will stop accumulating points to earn rewards vouchers as well as cease receiving first access to sales, promotions and events. If you still wish to cancel, you may do so any time on the Hairhouse Warehouse website. Simply log-in and request for your account to be closed. Can I use multiple rewards vouchers in one transaction? Yes, you can use multiple rewards vouchers in one transaction. To check if your last in-store transactions were added to your loyalty account, simply sign in to Style Society here. Your balance and status is shown in the Rewards Points field. If you’ve looked online and your points balance seems to be incorrect, be aware that points take approximately 24 hours to be loaded into your account. If you believe your balance to be incorrect, simply call our customer care team on email enquiries@hairhousewarehouse.com.au with your account details, email and card numbers and we’ll help sort it out.